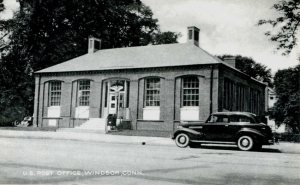 Description: Black & white photographic postcard of the U.S. Post Office building in Windsor, CT. This building was the fifth structure used for Windsor Post Office services. It was built in 1941 on Broad Street in the center of Windsor. A new Post Office was constructed in 1963 and this building now houses the Veterans of Foreign Wars organization.